Eddie Rickenbacker standing next to his SPAD XIII biplane (tail number S XIII 4523), undated. The “Hat in the Ring” insignia of the 94th Aero Squadron is visible on the fuselage. America’s Ace of Aces in World War I was not one of the young, reckless daredevils of the age. Born in Columbus, OH on 8 October 1890, Edward Vernon Rickenbacker was older than most. One of America’s most outstanding automobile racing figures when World War I came to America, he met General Pershing in 1917 and became his chauffeur. Shortly after, however, he volunteered for flight training and, despite his age of 27, was accepted. 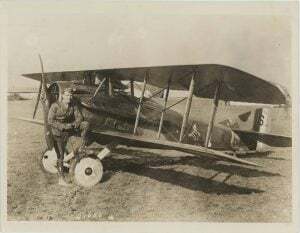 Following the U.S. Air Service training course at Issoudun, Lieutenant Rickenbacker joined the newly formed 94th Aero Squadron on 4 March 1918. Flying a Nieuport 28, he won his first victory on 29 April and by 28 May had downed his fifth plane, making him the U.S. Air Service’s first American-trained ace. He was credited with one more, an Albatros two-seater driven down out-of-control two days later, before a severe ear infection grounded him for the rest of the summer. Rickenbacker came into his own in September 1918, downing five more enemy aircraft and one balloon, and in October brought down fourteen more, the last one a balloon on the 30th. Following the War, Rickenbacker founded the Rickenbacker Motor Company, an automobile manufacturing company. In 1935 he joined Eastern Airlines, the firm with which he is best remembered, and eventually became its Chairman of the Board. Rickenbacker travelled thousands of miles in World War II visiting the combat theaters and particularly fighter units. On one trip to the South Pacific, his plane was forced to ditch and he and the crew survived a 21-day ordeal in life rafts. “Captain Eddie,” as he was known to millions, passed away on 23 July 1973 in Zurich, Switzerland.